Handmade in Kansas City: Cold Hands, Warm Heart - Meet the Maker of Sully's Softies! 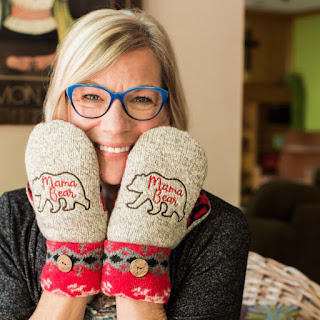 Cold Hands, Warm Heart - Meet the Maker of Sully's Softies! That one thing? You guessed it! It can get freakin' cold here. When I first arrived, I was able to stay warm, except for my hands....they were always cold! Try as I might, I couldn't find any gloves or mittens that would keep them warm, and as you can guess, I really, really, hate cold hands -and I know I am not alone! Am I right? Thus began my mission: To make the world's warmest mittens. And, to make them good looking to boot! The second part of my story is my love of thrift store treasure hunting. I love finding old things and repurposing and making them "new" and useful again. I am amazed at all of the "stuff" that people collect and then get rid of. Beautifully made wool sweaters that have a small stain or hole, caught my eye, and knowing the many benefits of wool made me consider them for my "mitten mission". I began making mittens for myself, and then I started getting requests from the mom's I would hang with while we watched our kids sporting events in the frigid weather. I opened my Etsy shop and never turned back. Sully's Softies are quality mittens out of felted wool, they are DOUBLE lined which makes them soft and oh sooo warm! Give Karen a big welcome to Handmade in KC by visiting her social media pages!